Residents of a homeless encampment in the Roseland area of Santa Rosa will be arrested if they refuse to leave the area as scheduled by a U.S. District judge. Sonoma County officials originally planned to clear the encampment out on March 23 but the judge extended the deadline to Thursday after the county was sued by the residents and advocates who said forcing people to leave was a violation of their constitutional rights. Amanda Friedman has been living in the camp behind the Dollar Store in the Roseland Village Shopping Center on Sebastopol Road for about four months and she said she doesn't know where to go once police clears out the area. "They made it so impossible out here to camp, to be homeless," Friedman said. Residents will be given a warning, issued a citation and arrested by Santa Rosa Police if they refuse to leave the site, the Press Democrat reported. 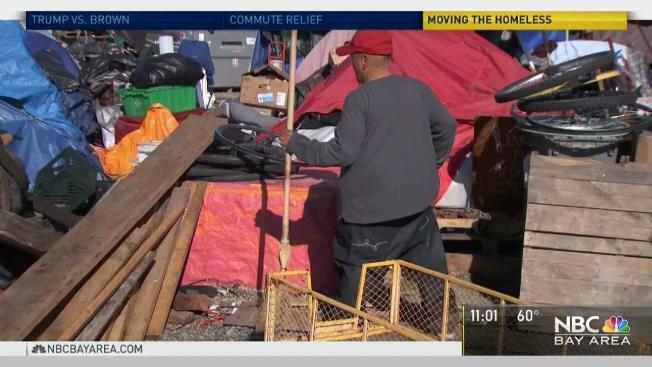 The Sonona County Housing Navigation Center has helped around 40 residents into temporary housnig and six people into permanent housing, officials told NBC Bay Area. The County has set aside 64 dedicated shelter beds for the people coming from the Roseland encampment, Homeless and Community Services Manager Jenny Abramson said. More shelter beds and transitional housing beds are also available through the county's Coordinated Entry program, Abramson said. On Tuesday, advocates implored the Sonoma County Board of Supervisors not to clear their encampment and pitched two tents on the concrete outside the county's Administration Center before the supervisors meeting started. More than a dozen, some angry, some near tears, accused the board of breaking a promise in December not to clear the camp until alternate housing and access to social services were found for them. The two camps have been home for about two years to more than 100 people, including many who were rousted by other camp clearances. The county's Community Development Commission wants to clear the land, which it owns, and begin site cleanup for the development of a 175 apartments that are to include some affordable units. The Community Development Commission set up a navigation center near the camp on Feb. 23 to assess the campers' needs and provide referrals and information about safe housing options that include temporary and permanent housing and access to health and human services. Some speakers said Tuesday that Santa Rosa police were traumatizing the camp residents and issuing citations, and others said the encampment was their home. One camp resident said a survey of 50 campers found 82 percent were disabled and 25 percent of them were on social security disability. Fifty-eight percent of the campers are women. "You promised us a transitional village and nothing happened" one woman said. "Shelter beds are not a solution. Please do something," she said.